It’s February, and soon NYC will be painted pink and red and boxes of chocolate and racy lingerie will be put to good use in the throws of holiday romance. Where will yours truly be this year? Jury’s still out. I actually dated a man for about 8+ years and I think we celebrated Valentines Day maybe twice? I have a thing with forced romance or commercially-fueled celebrations. All I know is the bottle of champagne I have still from one of the wineries on the South Fork will probably make an appearance. But, heck, baking is what I do and celebrating with food is what I love, so it’s fitting that this month’s BlogHop theme, of which I’m excited to be one of the cohosts for the first time, is Chocolate! I use chocolate (and carob) all the time: fair-trade, organic and usually vegan as I can then be assured of the dairy-free aspect. I’m a big fan of extremely dark varietals, decked with spices or infused with flowers. I ate my fill at the NY Chocolate Fest a few months ago, where I grabbed Paul A. Young’s Adventures in Chocolate, which I have been pouring over with hungry eyes (check out my Spicy Mexican Mulled Wine Cocoa play on one of his recipes). I don’t think chocolate has to always be the center of the sweet, though, so when stretching my cranium for my bloghop contribution, I wanted a rich, spicy and subtle alternative to the abundance of chocolate this time of year. Luckily, Young is a master at making a variety of complex, versatile chocolate desserts – I highly recommend his book as a present for the Valentine in your life. The result? This tea bread is of my new favorite recipes, and one that will be a staple in my hosting repertoire. I bake delicious things all the time, but this I will serve with particular love. Laden with fruit captured perfectly in a dense, spicy cake, the chocolate compliments the other flavors and the tongue finds it in just the right moments. It’s solid without being heavy. Exactly what you want in a fun take on a traditional British tea bread. I’ve adapted it to be gluten free and, if you use dark chocolate, it’s naturally dairy free in Young’s original recipe. I adjusted here and there for what I had in my pantry and to make sure the gluten-free flours could hold up. I used puer tea as a nod to my friend Louis, who’s visiting from out of town and with whom I first drank puer years ago in San Francisco. I’ve given slices of it out wrapped in parchment like little gifts from a Dickens novel. Sh*t, I’m getting all romantic. Here’s the blasted recipe. Note: you need to soak the fruits overnight! 1 3.5oz bar 70% dark chocolate, coarsely chopped – I used Divinebecause it’s fair-trade, 1 bar is exactly 3.5 oz, it’s not overly expensive and I hadn’t tried it before. In a medium bowl, combine ginger, raisins, nutmeg, orange zest, brown sugar and tea. Mix to combine, cover and let sit 8 hours or overnight. When ready to bake, preheat oven to 325° and line a 8×4 inch loaf pan with parchment. Add beaten eggs to fruit and mix thoroughly. Add flour and incorporate completely. Stir in dark chocolate. Pour into loaf pan and smooth out the top. Bake for 80-90 minutes, cool for 30 minutes before carefully removing from pan. Young suggests wrapping the cooled cake in clean parchment and a kitchen towel and letting it sit for 24 hours. He overestimates the layman’s patience, I believe. I cut into this baby 1 hour after it was done baking and it was divine, but the wrapped pieces did taste even richer then next day. Please check out the recipes from the other co-hosts and peruse links below! and visit us all on Twitter! Please join in on the #chocolatelove fun by linking up any chocolate recipe from the month of February 2012. Please link back to this post, so that your readers know to come stop by! The twitter hashtag is #chocolatelove. Love the flavors in this — several of my favorites — and a nice change from all chocolate everything. Why thank you! The chocolate definitely adds but nothing steals focus. Going to make this again really soon, it’s lovely. 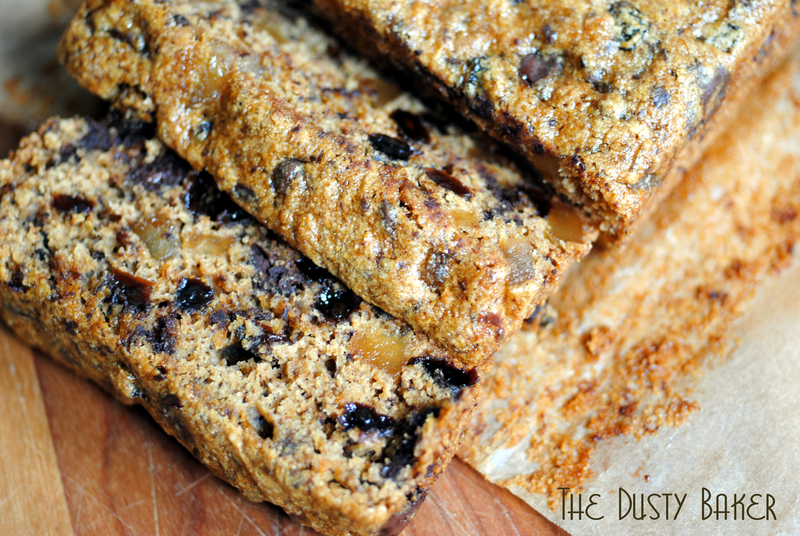 Lovely recipe!I love Tea breads and these with ginger look really good!Thanks for sharing! YES DARLING! Love that you got that, and that it made you smile. Let’s get coffee soon! this just looks amazing. 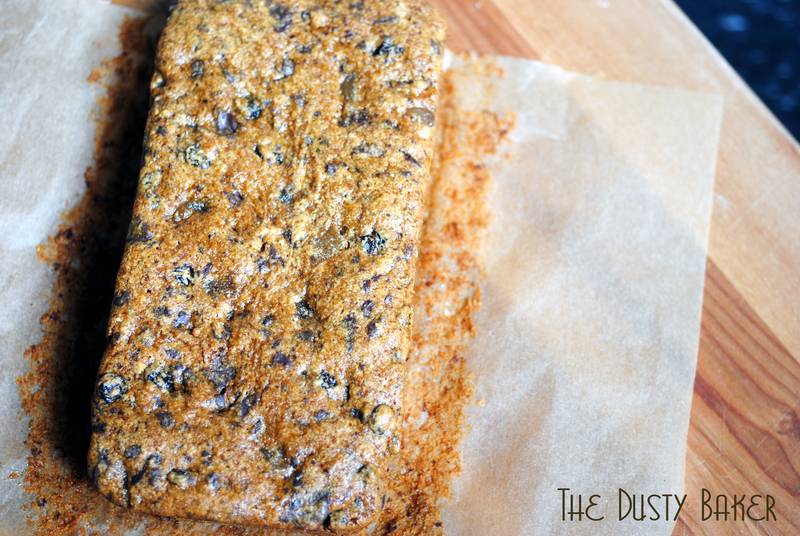 I love tea bread for its texture and by adding the ginger and chocolate together just brings it to a whole new level! LOVE! Chocolatelove that is! LOL! I can’t believe that this bread takes 80-90 minutes to bake but it sure as heck looks like it was worth waiting for! I know! I was shocked when I read that in the initial recipe but the oven’s on a lower heat and it came out perfectly! So moist and really, REALLY delicious. This looks great! I sometimes think chocolate is best as a complement to the dessert flavor, rather than the main flavor. Agreed. In this the chocolate was the perfect compliment! Gorgeous and super creative bread. Welcome to bloghop and look forward to sharing recipes. This bread really looks so good! It is quite divine. I love candied ginger and honestly just used what I had left… but now I’m dashing to the store for more so I can make it again!!! Tea, coffee, a little booze… so many liquids can go into this recipe it’s just FUN! And especially delightful when eating with some tea. 90 minutes to bake!! Really? It looks super delicious. I’m sure its worth the wait. Yeah, I was shocked that the recipe called for it to bake that long but kept checking it and Young was spot on. It’s so moist and delicious! wow i love how its gluten free and you used divine dark chocolate! it’s been wonderful having you be a part of our lovebloghop. sending some #chocolatelove to u! ps – so excited that i can peruse thru your GF recipes! So excited to be a part of the #chocolatelove hop!! It was such an exciting weekend with the three swaps, all involving such incredible people! Can’t wait to explore more of what everyone’s put together! I bet this is a divine combination, and I’m so happy it’s already gluten-free :-) Never heard of puer tea before-always fun to learn about new things! I definitely want entry making this-happy to celebrate # chocolatelove with you! I love. I adore. I crave for chocolate ginger. Enjoy them in gluten free macarons but this is genius with the tea bread, Jacqueline. Great idea! This sounds amazing – I’ve never had tea bread, but ginger and chocolate chips sound perfect with it. Great recipe! I love this tea bread with all of the spices, the orange zest and the dark chocolate, of course. Amazing flavors. Sending you #chocolate love. This looks so pretty and delicious! I love recipe and photos too! Well done..
I’m loving all the ingredients in this recipe, don’t care how long it takes to bake…I’m making these! Stopping by to send you some #chocolatelove! Loving the addition of the citrus zest in this cake, perfect with tea! I will need to try the tea you used, never heard of it before! Love your combination of flavors and healthy twist to all this chocolatelove! I love fruit and chocolate together. I can definitely see sharing this with friends over tea. Yum! I made this bread yesterday. I was a little skeptical at first: so many flavors, so much competition in one loaf, where was the oil or butter? But as several others have commented, I love all these flavor and I have access to some very high quality, aged pu’er tea and wanted to try your recipe. I love the flavor and texture of the bread but I think next time I will use less ginger and chop my chocolate finer. Do you have any hints for preventing all of the chunks from settling at the bottom of the loaf? I have my doubts whether the amount of flavor the pu’er tea adds warrents the use of the aged pu’er tea I used. I think a cheaper, strong black tea would suffice, but all in all I love the recipe and combination of flavors. And I love how your cooking and blog doesn’t feel restricted at all by being gluten-free! Thanks! Hello! Thanks so much for filling me in!! I had the exact same doubts about the amount of fruit and lack of fat, and was astounded when it worked! And can you believe my amount of ginger was less than half the original recipe?! It is a lot of ginger, but I loved it for that and thought it actually balanced the puer well. Did you soak yours overnight? I did get the smoky puer flavor in mine, but a more complex black tea would definitely add to it as well. I’m not sure why your chocolate sank to the bottom – mine was chopped to about the side of the chunks you can buy in bags – bigger than chips but coarsely chopped. Tossing them in flour may work? And making sure the oven is properly heated? Let me know how your next version comes out, and thanks for stopping by!